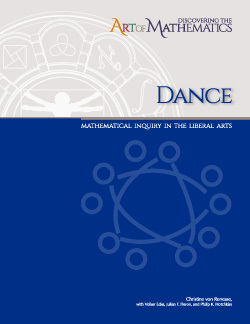 The learning guide “Discovering the Art of Mathematics: Dance” lets you, the explorer, investigate connections between mathematical ideas and concepts and dance related ideas and patterns. Moving in symmetry will lead to classifying types of symmetry and Frieze patterns. Dancing Salsa Rueda allows you to explore combinatorial ideas, while Contra Dancing will link with group theory and permutations. You will discover topological ideas while playing with different positions in Partner Salsa Dancing and use Maypole dancing to investigate fundamental domains and create beautiful geometric patterns.